You are in Siem Reap? 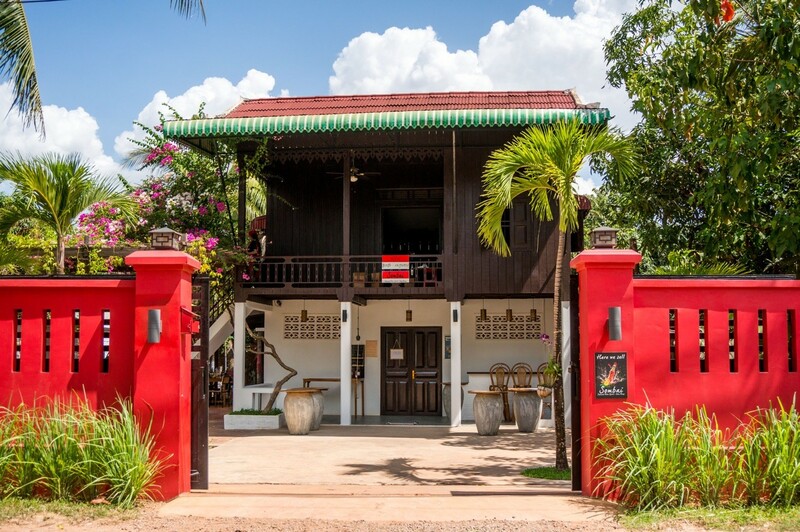 Tasting Sombai is, after visiting the Temples, a must-do in Siem Reap and Cambodia, as recommended by The New York Times, Lonely Planet, Rough Guide, Travel Pulse, Australian Gourmet Traveller, AFAR, etc. 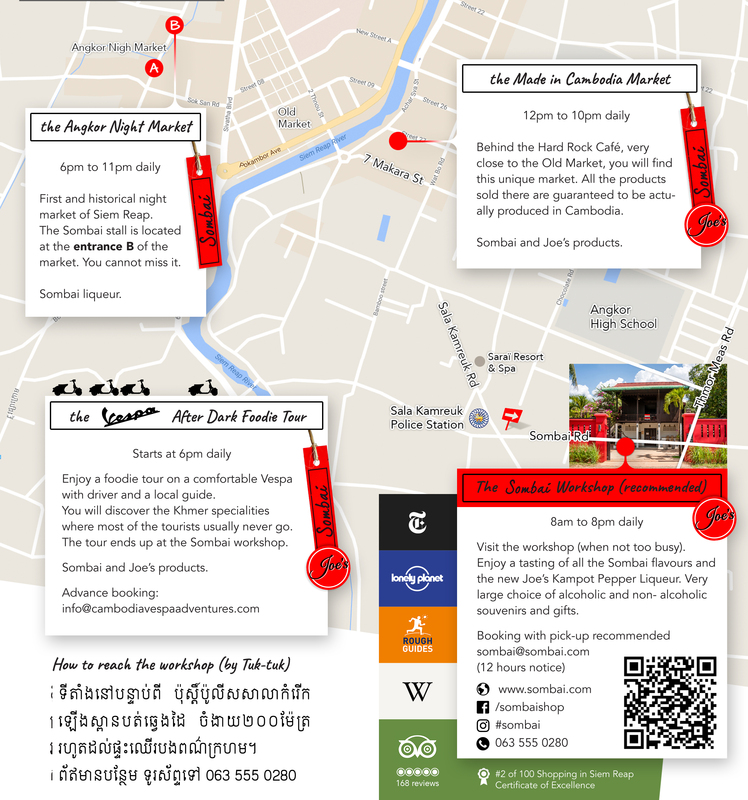 You will be offered a tasting at the Sombai Workshop & Shop, which is located in Siem Reap, Salakamroeuk village. 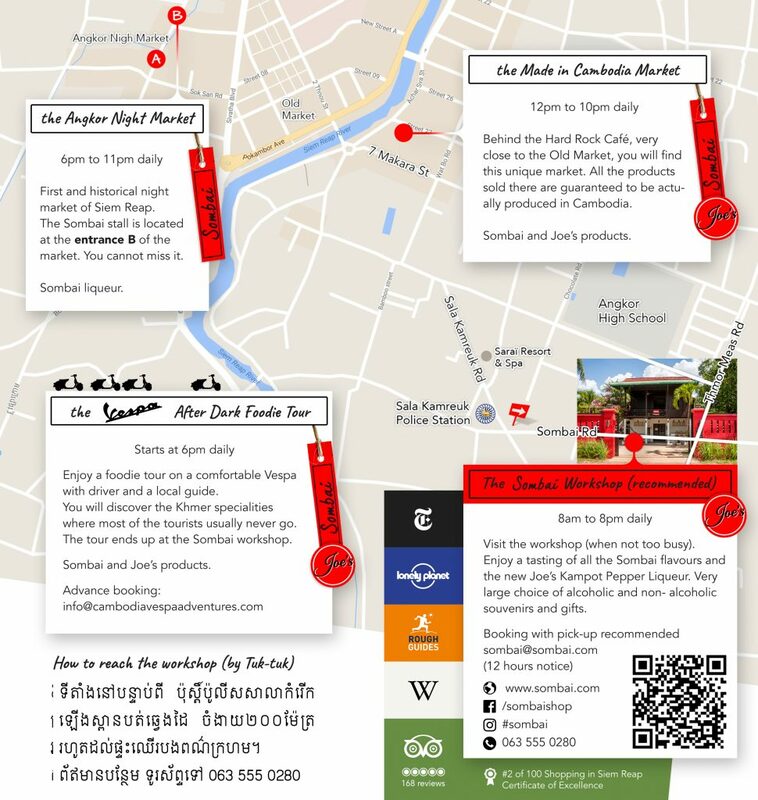 If you don’t have time to come here, Sombai, being THE beverage of Siem Reap, can be found in many places in town, including hotels, restaurant, bar and shops, but also at our market stalls (Angkor Night Market and the Made in Cambodia Market). Sombai slowly starts to be also available in other cities in Cambodia, including Phnom Penh and Battambang. It is why it is considered by some as THE national beverage of Cambodia. I am staying here for a week near the Old Market. Where can I buy a bottle to take home? Thank you Mary for your interest in Sombai. You can find painted bottles of Sombai at the Wild Poppy Shop on the Alley West (opposite the X-Bar). Or you can come to our home factory for a free tasting and presentation. Feel free to give us a call (095 810 890) for booking and if you need a pick-up. Hi! We would like to come for a tasting, tomorrow, 05-02-2016 around 1430. Can this be accommodated? Sure you can come tomorrow at 2:30pm. If you come with a tuktuk, the driver can call this number to get instruction in Khmer (063 555 02 80). Siem Riep. Where is the nearest place to buy your products? If I want to come to your factory, should I take a taxi? We are in a close partnership with Le Méridien, what they call “Unlocked Art” Partner. Ask the Concierge at the Lobby; normally they offer the round trip in tuktuk-tuk, and we offer the visit, snack and tasting at the workshop. In the worst case, we have a few products in the souvenir shop at the Lobby of Le Méridien and some flavours by the glass or in cocktail at the Naga bar. Yes, you can come at 3pm, 4pm or 5pm as you wish.